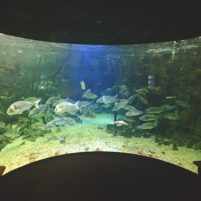 Under a pier, crashing wave, incredible invertebrates, spooky shipwreck, kelp forest and more... Click here for information on the different areas of the aquarium and what you might find! Click here to see what's going on in the aquarium during the season! Don't forget to also check our Facebook and website diary for news and events! Our Sea Zoo Parent scheme makes a special gift for someone - or why not treat yourself? Click here for more info on our Animal Adoptions!